Today I’m sharing another set of favourite images from the recent Fall Photography Tour based at Aurum Lodge in David Thompson Country. This set is from Kerry Leibowitz. Kerry is somebody I’ve known casually online for a few years through our mutual membership in the NatureScapes.Net community, but we had never met before this. We corresponded extensively prior to the fall tour since Kerry wanted to make the most of his trip to the Rockies by doing several solo days prior to joining the group. It was a treat to discuss possibilities and then work with somebody with a really intensive focus on soaking up as much as possible from what the region has to offer. Kerry definitely threw himself fully into the experience. 🙂 He knew his own mind and had clear photographic goals, but equally was open to experience whatever opportunities came our way, or to consider an alternative concept at any given location. I think that’s a great combination of attitudes to have to get the most out of travel and landscape photography. Thanks for joining our group, Kerry! If you like Kerry’s favourite 5 below, check out more of his work at his web site. And if you enjoy following people who write about their photography experience, then I recommend Kerry’s blog as well. I don’t often do the tour/workshop thing, but I know that I can frequently benefit from leveraging the locational knowledge of an experienced local photographer as a guide. That was my goal when I decided to join Royce’s Rockies workshop and it turned out to be a very good call on my part. 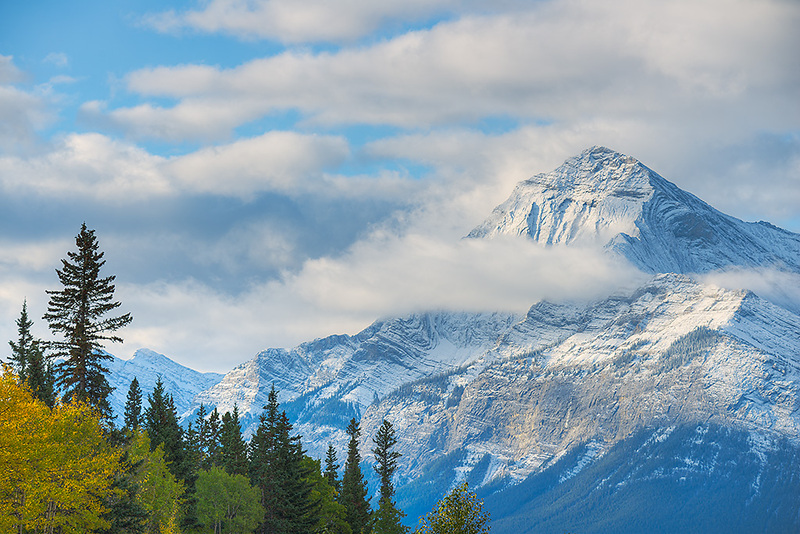 I’ve been seriously photographing landscapes for 17 years, but I’d never had the opportunity to visit the Canadian Rockies prior to this trip. I spent parts of eight days in the region shooting on my own and then joined the tour to close out my two-week trip. Our group was based in David Thompson Country — a part of the region I surely never would have experienced without joining the tour (which would have been a shame). It’s an area that Royce knows extremely well. This was evident every day of the tour as we made the most of all the available light, visiting locations at the most opportune time for image making. After eight days of relying on my own judgment about where to shoot and when, it was kind of nice to turn that responsibility over to someone who obviously had the the experience necessary to make the most of each minute of daylight. It was both enjoyable and instructive to shoot with Royce, his co-leader Dan Wheeler, and the other tour participants — Ellen, Kim and John — each day, as each person brought his/her own unique set of experiences and proclivities to each location, making for a myriad of approaches to the available subject matter. I had such a good time that I’m hoping to return to the Canadian Rockies for more such experiences next fall. All images made with a Nikon D800E and one of three lenses: 14/04/2.8; 24-70/2.8; 80-400/4.5-5.6. 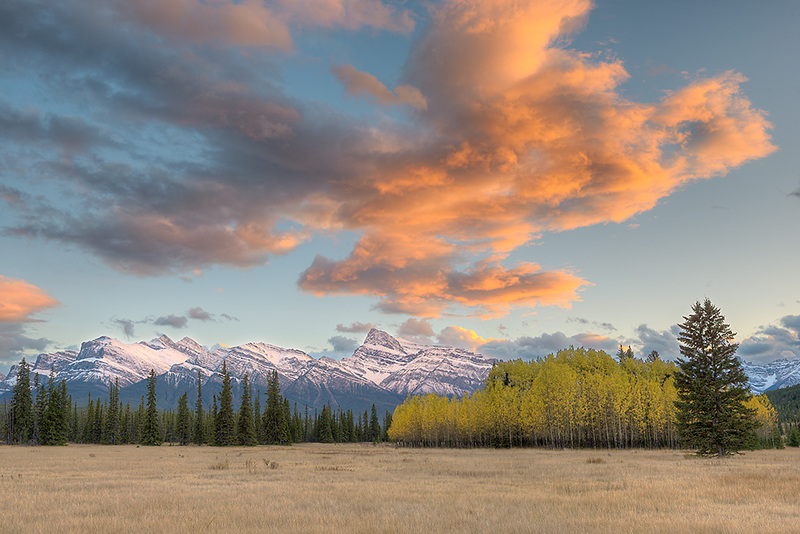 Kootenay Plains at Sunset. Copyright © Kerry Leibowitz. On the very first evening of the tour, after a short set of introductions, we headed 15-odd minutes from the lodge to the Kootenay Plains, an area of vast grassland punctuated with stands of aspens and conifers and a backdrop of snowy peaks. As Royce noted in his brief remarks to us as we arrived, this was a location with 360 degree views. I was entranced by this spot, with its compelling elements so splendidly laid out, accented by rapidly changing light and fast moving clouds in a sky that seemed larger than life. I resisted the urge to rush around and capture everything, focusing my attention on the view toward Mt. Peskett, including this image. 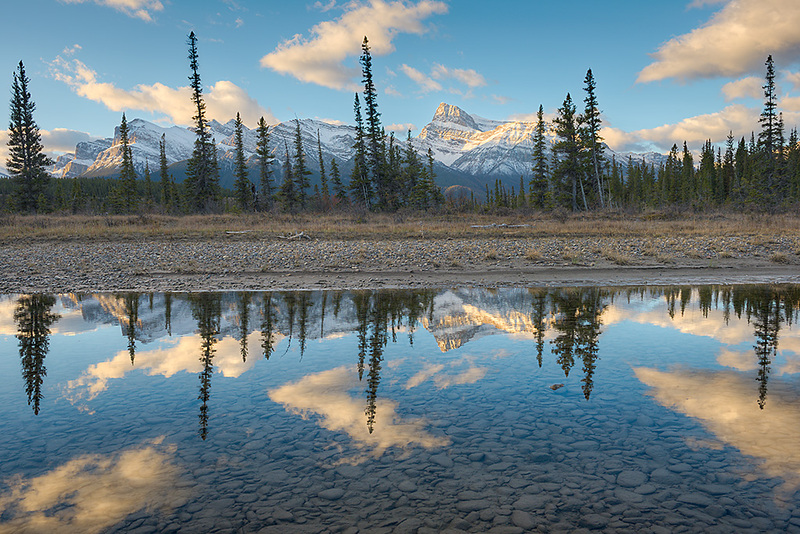 Kootenay Plains Reflecting Pools. Copyright © Kerry Leibowitz. At first light on the first full morning of the tour we decamped for the reflecting pools area of the Kootenay Plains, a bit further down the road than the broad grassy meadow that had been the site of the previous evening’s shoot. The primary goal was to photograph reflections in these pools of water — not far from the banks of the Saskatchewan River — at sunrise, but in the early light few clouds were in the eastern sky and a persistent wind killed the reflections. The decision was made to light a candle rather than curse the darkness, so other subjects in the immediate area were sought out, but I always kept one eye, at least figuratively, on the pools, with the hope that conditions would improve. That they did, not long after the sun was up. An array of puffy clouds arrived and the wind died down. I was mesmerized by the resulting symmetry, but managed to produce this image before the resurgent wind obliterated the possibility. Elliot Peak from the David Thompson Highway. Copyright © Kerry Leibowitz. I’m always on the lookout for creating a sense of depth with a telephoto lens, but I don’t often find subject matter that allows me to put the concept into practice. But while photographing aspen forests buttressing both sides of the David Thompson Highway one afternoon, I took a glance up the road. Something I saw caused me to pull out my telephoto zoom and take a look at a compressed view of the scene. Low clouds were cutting across Elliot Peak from this perspective and, at roughly 200 mm, the mountain took on a looming presence that wasn’t evident with a wide angle or normal lens. By including some of the “foreground” trees (hundreds of feet away from my shooting position) the goal of establishing depth was fulfilled. Elliot Peak at Sunrise. Copyright © Kerry Leibowitz. We were photographing a particularly impressive pre-sunrise scene over Lake Abraham from a rock pile along the highway one morning when the old photographer’s aphorism “always look behind you” popped into my head. 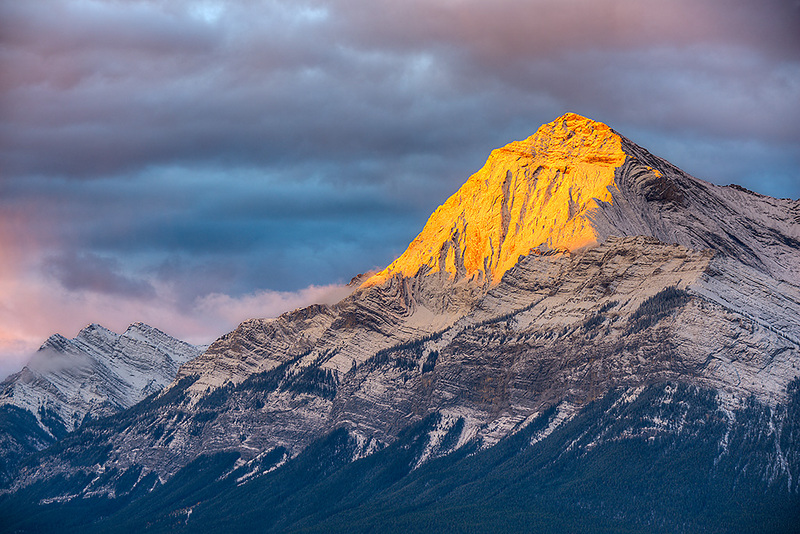 Casting a glance over my shoulder, I saw sublime light bathing the face of Elliot Peak. I repositioned myself as quickly as I could and, benefiting from my decision to utilize two camera bodies on this trip, quickly grabbed the one with the telephoto lens attached and composed the shot you see here. It’s probably my favorite peak portrait of the entire trip. 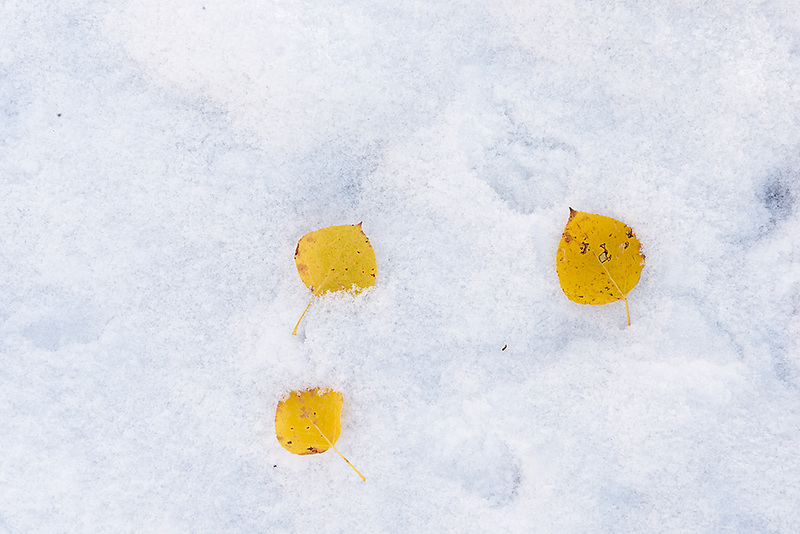 Aspen Leaves in Snow. Copyright © Kerry Leibowitz. Snowfall of 1-2 inches at the lower elevations greeted us one one morning and during the ensuing day we took a trip to the old coal mining community of Nordegg, which involved a short hike down an abandoned railroad track/trestle. The sun was out brightly that day and I found myself struggling to find compositions that were complemented by the conditions. On the return hike, I was using my copious experience photographing in cluttered natural environs to scope out tight scenes that were in open shade and I luckily stumbled across these fresh aspen leaves in the snow. It was a rare opportunity, at least in my experience, to capture the real time juxtaposition of seasons in an intimate landscape.